I’ve been able to spend about 10 days with the ASRock Z68 Extreme4 motherboard, and I’m now able to give it a cursory overview, having kicked the tires a bit, with both Windows 7 x64 SP1 and VMware ESXi 4.1U1. VT-d / VMDirectPath / DirectPath I/O Configuration works! Good efficiency: Entire system (10 3.5” drives, 3 SSDs, 1 DVD, 16GB RAM) coupled with Core i7 2600 (not the 2600K) consumes about 168 watts at idle, which was a tie with the MSIZ68A-GD80 (B3) motherboard I previously used in the same configuration. That drops to about 138 watts, if 7 of the drives are idle and spun down (controlled by LSI RAID controller). Haven’t properly loaded it yet to test for max watts. I can say that the least irritating is the ASRock UEFI (BIOS). Admittedly, one shouldn't have to spend much time the BIOS once the system is operation, but it doesn't hurt for it to not be a dreaded task either. I found everything I needed quickly and easily (boot order tweaks, VT-d and virtualization features, etc.). And I especially like F11 at boot time, for convenient choice of boot OS (ESXi on USB key or Windows 7 on disk), without having to really go into the BIOS. 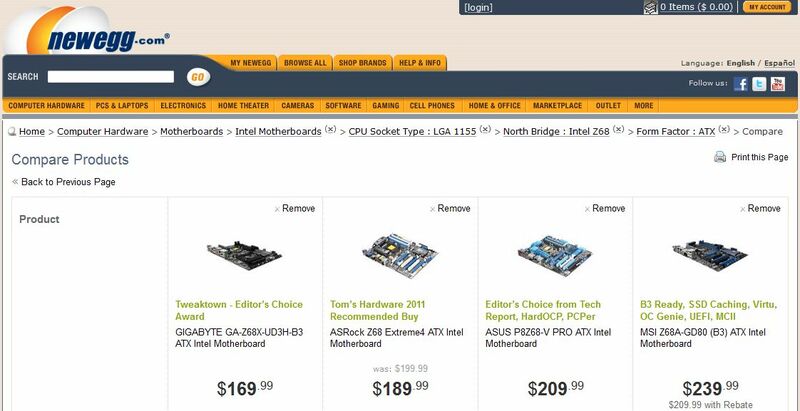 FYI, here's current list of all newegg.com Z68 ATX motherboards that they carry. This is nitpicking, and not a fatal and/or showstopper type of an issue for me, and one that may be resolved at some future release level of ESXi. So, instead, I’m using an added Intel NIC that works well for my needs.